Intel says its coming Xeon SPs (scalable processors) will run in-memory SAP HANA workloads 1.59 times faster than a Xeon E7 v4 system*, and has demonstrated Optane DIMMs. The Xeon SP family of processors will be available in the middle of this year. El Reg thinks these are Skylake mills. 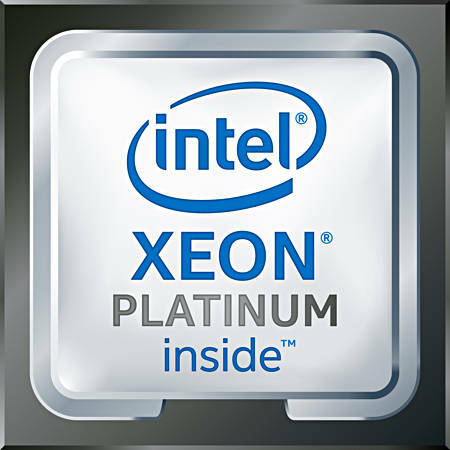 There are four Xeon SP brand variants in reverse order of performance: Platinum, Gold, Silver and Bronze. They offer a new core, cache, on-die interconnects, memory controller and optimised features for compute (duh! ), storage and networking. Intel reckons they are suited for, amongst other things, the demands of big-data, and in-memory workloads. At the SAP Sapphire NOW event, Intel said SAP had certified HANA to support up to 6x greater system memory - for OLAP Processing - on the new Intel platform for 4- or 8-socket configurations over the representative installed base of systems available four years ago. That’s up to 3TB of memory for 4-socket systems and 6TB for 8-socket ones. The "representative installed base" means Xeon E7 CPUs with support for 0.5TB to 1TB (8-socket) of DRAM. It’s a whacking great jump in maximum memory. Intel also demonstrated 3D XPoint Optane persistent memory in a DIMM form factor at the SAP event. Use of this memory in SAP HANA systems should increase system performance further, by bringing data within the low-latency Optane access arena from the longer latency NAND drive storage tier. Intel said its Optane memory will be available in 2018 as part of a Cascade Lake refresh of Xeon SP. We understood Kaby Lake server CPUs with 200 Series chipsets would support Optane memory. Now we know about Cascade Lake, which is a Xeon supporting Optane NVDIMMs, and think the refresh could refer to a Skylake SP to Kaby Lake upgrade. * Based on SAP HANA internal S-OLTP workload (internal testing) with the baseline config being: one-node, 4S Intel Xeon processor E7-8890 v4 with 1,024 GB total memory on SUSE Linux Enterprise Server (SLES) 12 SP1 vs estimates based on SAP internal testing on one-node, 4S Intel Xeon Processor Scalable family system.